I'm sharing my work for Crafting When We Can this morning & our challenge theme is to use Hearts & Flowers on your work. 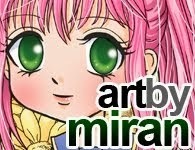 We're sponsored by ArtbyMiran and they generously gave each of us an image to work with-THANK YOU!!! I chose to play with Be My Valentine digital stamp....isn't she beautiful & so much fun to color!!! I'll be using her on my next Valentine's cards as well as birthdays, Anniversary...you get the idea!!! My teammates also created some pretty eye candy for you so check out our blog & while you're there; read up on our rules so you can play along with us! I can't wait to see what you all come up with....have fun & happy stamping everyone!!! Super sweet image and card! Beautiful! What a great card Jackie...I love the doily and you did a great job coloring...Very well done. Very cute and I love how you color you images such a beautiful card . Love the heart background, super cute image and card! What a stunning card! I love the colors. Oh those hearts are colored so well! This card turned out really cute and with great layout. This is one adorable girl! I haven't made many girly cards, having only nephews, but the one who started school this year has mostly girls in his class, and he gets invited to a lot of birthdays, so my sister has asked me to make her some girly cards, I'm so looking forward to that! Picking up lots of inspiration for girly designs over at your blog:) your coloring is fantastic, love the shading of the hearts, so well done! What a wonderful project Jackie. Thank you for sharing it with us at Stampin for the Weekend and good luck in our challenge! Love all those hearts. The big one makes her look so mysterious. ;-) Love it! Creative Blessings! Jackie, This is so sweet! Love the image and your layout is just so soft and balanced. Showcases her perfectly! what a very pretty card! I really like the little flowers you have added. Such a wonderful creation with great attention to detail. Love the colours and embellishments. All the elements work so well together. It is perfect for our first ‘ANYTHING GOES’ challenge. Thanks for sharing your talent with us. Good luck. Beautiful. Adorable image and love the colors.